It’s time for another round of Adopt a Gluten-Free Blogger – a monthly carnival started (and this month hosted) by Sea from Book of Yum. I love this carnival – I don’t have to think of a recipe and I get to explore the recipes of the spectacular gluten-free blogging community. This month I chose Lexie of Lexie’s Kitchen. Lexie posts recipes that are free of gluten, dairy, eggs, and corn with an emphasis on natural and low-glycemic sweeteners. She came to her diet in an attempt to heal her son, Miles, of his intestinal and neurological health. You can read all about Miles on Lexie’s blog. Anyway, I was asked to bring some gluten-free vegan brownies to a fund raiser event that was held last night. And, it just so happens that right after I said I would, Lexie posted 2 different brownie recipes: Hazelnut Brownies and Almond Butter Brownies. Woo hoo! So, then she posted the Almond Butter brownies, and I figured I better try those, too. I’m telling you – these are rich, fudgy, and gooey. Oh oh. A little bit too gooey for handing out at fundraiser. I think it was my fault – I think I under-baked them just a tiny bit. No problem. I kept this batch for us (and our happy-to-help-eat-them neighbors), whipped up another batch of the hazelnut version with the same substitutions, and pleased the crowd at the fundraiser, as well. So, head on over to her blog, and while you’re there, why don’t you pick out a recipe or two to try for the kiddos in your life? I know which one is next on my list to try: Nutty Nola. Thanks for sharing your food journey with us, Lexie! OOooooooooooh YUM! 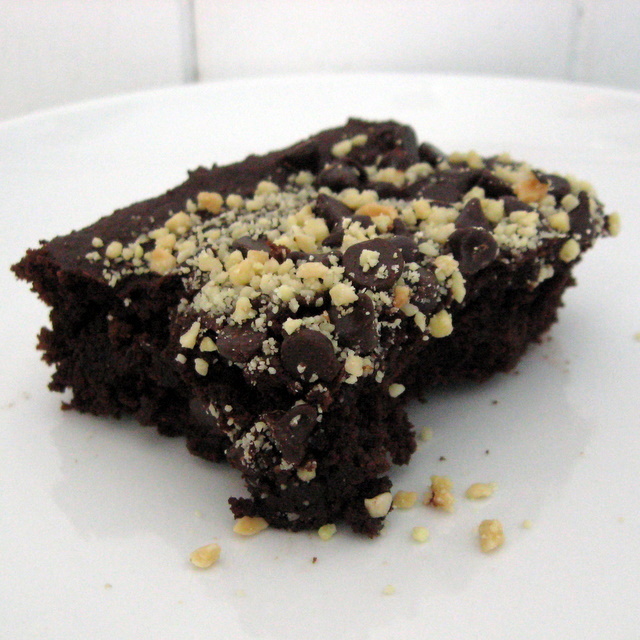 Almond butter brownies, OMG! Deanna! I just saw this. I am so very touched : ) How could I miss being adopted … guess I’ve had my head in the sand or in a batch of brownies! I am so thrilled that these worked for you. Thank you, thank you for being a brownie tester.